On the back streets of Kings Cross station, you will find this new, homely and small espresso bar meets Asian eatery called Glider. Bright white meets red, and a bit of quirkiness in between. Had the chance to meet and speak briefly with the owner Mark. Single origin coffee is brewed by him. I discovered him perched on one of the benches outside, as I just arrived in the nick of time for lunch on a relatively quiet and wet weekday. A mini-menu on a wooden clipboard was handed to me, and you're more than welcome to watch your food being prepared in front of your very eyes. Mark's wife is the whiz at Asian cuisine. If you love your Vietnamese fare with some quality coffee, you'll fit right in. 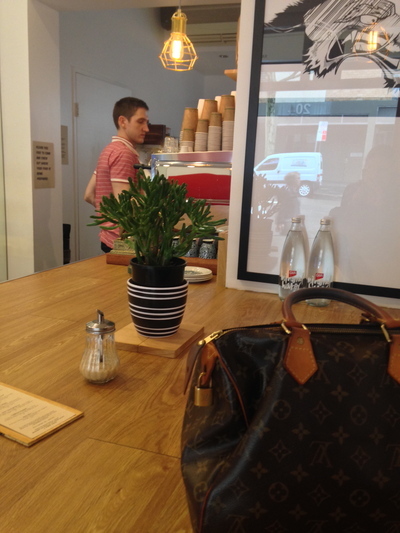 I sat inside with views of the coffee machine and well organised front counter area. There are a few quirky objects hanging on the walls and perched on this sole, indoor communal table - the latter of which I had all to myself on this occasion. Despite being told that the coffee here is top notch, I opted for a glass of water to drink instead. The latter came to me complimentary in a black cup. Food wise, the rice paper rolls looked enticing, yet I have had an abundance of Miss Chu rice paper rolls as of late, that I decided to go for something different. If I was in the mood for some noodles, I would have gone for the Bean Vermicelli Stir Fry. A great, simple lunch indeed. On this occasion, the duck was a winner. Put simply, the dish I ordered was well worth waiting for. All dishes are cooked fresh to order. 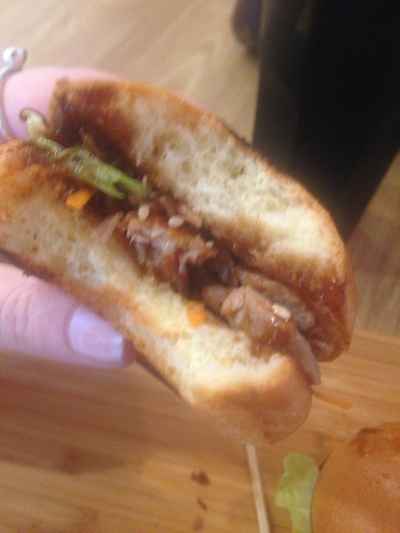 The Duck Gliders ($12) with peking duck, grated carrot and fried peanuts with hoisin sauce drizzled on two sonoma brioches looked rather simple and small, yet it was divine. This dish filled the spot. I was worried when a subtle burnt smell was coming from the kitchen, knowing that it was my dish. There were a couple of burnt areas on my brioches, yet all in all they were amazing. 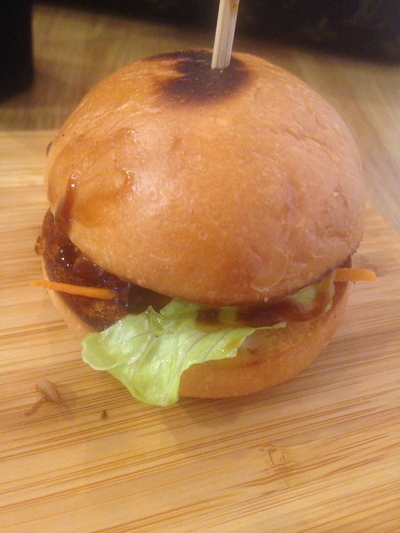 The hoisin sauce ensured the right amount of thickness to moisten and tone down the sweetness of the buns. The duck blended in beautifully with the rest of the ingredients. It took a while to eat these two little beauties. For me, they definitely filled the spot. The carrot is barely noticeable, as the duck and the sauce are prominent features with the brioches. 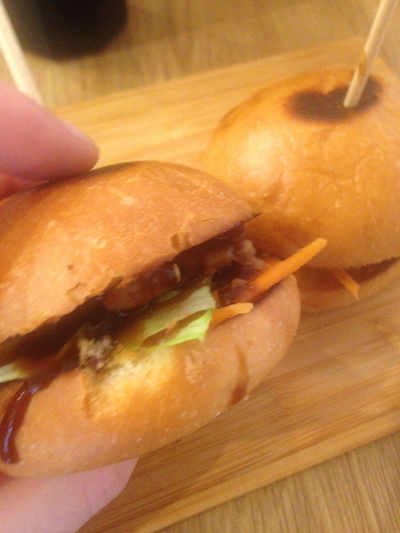 If you love your sliders, as well as your peking duck pancakes, then you've found a little leaven of foodie love here in the Kings Cross/Potts Point area. A newbie but a goodie. Simple ambience, with simple presentation. You will rave about their coffees and Asian fusion. The ambience may get there, we will just wait and see. 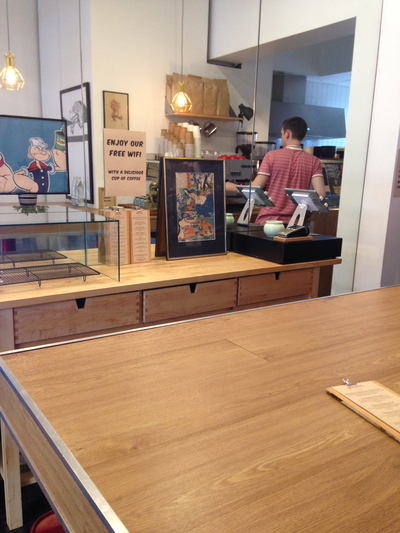 On the cross, the hunt for good food and good coffee now rolled into one is finally over. 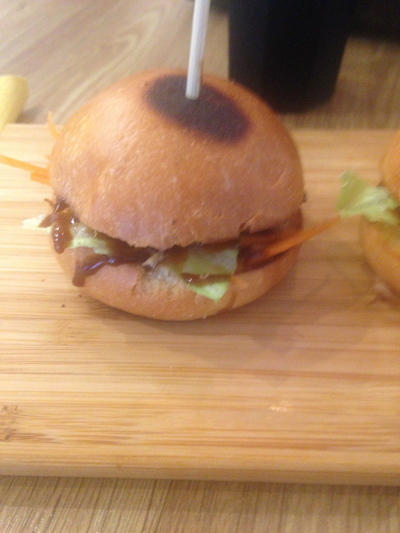 Where: 197 Victoria Street Potts Point NSW. 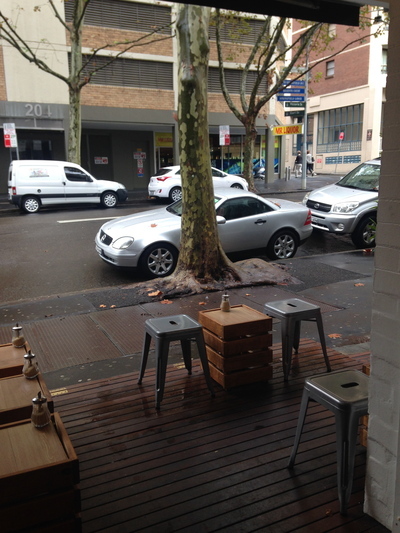 Why: For good coffee and good food in the cross - a rare combination. Cost: My bill came to $12. When: Lunch during the week. If you're an introvert at heart, you'll love it here too. Take away: Yes - coffee, most definitely.